What do baking and letter writing have in common? Passion! Communication! Adventure! Two of my most revered friendships came about because of letters I wrote. Last year I told you about Rose Levy Beranbaum; today, I would like to share another story about meeting M.F.K. Fisher, and share the recipe she loved most of all the things I made for her. 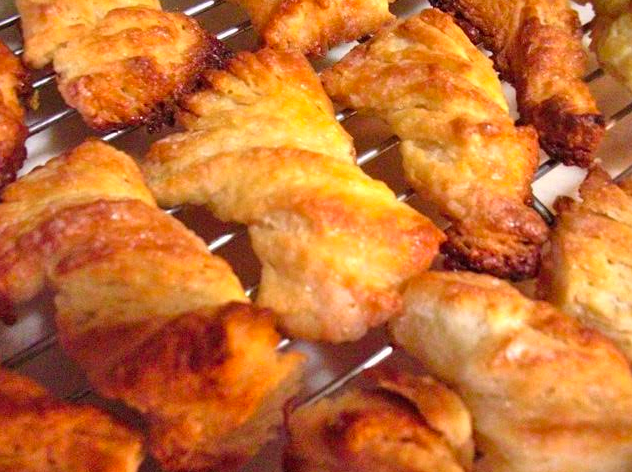 The recipe is called “Starlight Sugar Crisps,” from a 1950s Pillsbury Bakeoff book, a croissant type of pastry laced with vanilla sugar. Flashing back for a moment, someone lent me The Art Of Eating, an anthology of five books written by M.F.K. Fisher. 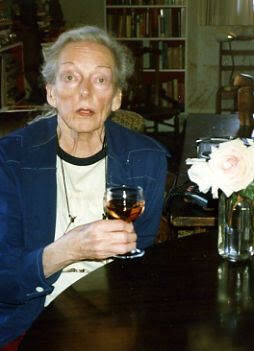 Her style, sensibilities and wry humor captured me instantly. She made me fall in love with France all over again. Soon I was making pasta with just-melted butter and parmesan cheese, as described in How to Cook a Wolf, along with soft- boiled eggs for four minutes exactly, then plunged into cold water. Perfect every time. 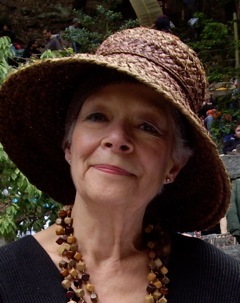 Twenty years later, after I had returned to San Francisco, I learned that she lived in Glen Ellen. I called Jim Wood, newspaper food editor, and begged to have her address. He gave it to me, I wrote a letter, and two days later I received a reply and an invitation to visit. Oh my! All visits had one rule: Everyone must leave at 2 o’clock. Her work time began then without fail. I was at a terrible crossroads at this time in 1985 – my mother had had a series of strokes and my oldest son, Tom, was slowly declining from AIDS. On the horizon also was my first photographic show at the Joseph Dee Museum. 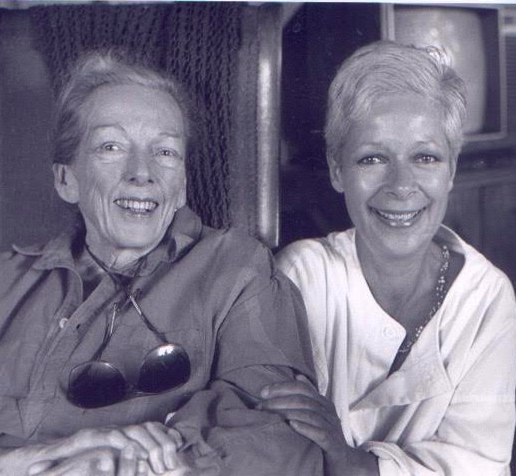 Happy and very sad at the same time, I trudged through those days buoyed by my new friendship with Mary Frances. When I was with her, my cares dissolved and new strength came. It wasn’t something she did; it was something she was. Every visit I would bring a surprise, but she began asking for the Starlight Sugar Crisps every time, so I made them on a regular basis for her. Here is the recipe. Please read through the entire recipe and assemble your ingredients. Soften yeast in warm water with pinch of sugar. You want to make sure the yeast will bubble and rise. Sift flour and salt together in large mixing bowl. Cut in the butter and the shortening until particles are fine, then add the eggs, sour cream and vanilla, and mix well. Cover, then chill at least 2 hours. To fashion the crisps and bake: Preheat oven to 375º. Place plastic wrap on rolling-out surface and sprinkle with ½ cup vanilla sugar. Roll half of the dough out to a 16-by-8-inch rectangle; sprinkle with 1 tablespoon vanilla sugar. Fold one end of dough over center. Fold other end over to make three layers. Turn one quarter of the way around and repeat rolling and folding twice, always with additional vanilla sugar. Roll out to 16-by-8-inch rectangle about ¼-inch thick. Cut into 4-by-1-inch strips. Twist each strip 2-3 times, then place on ungreased baking sheet. Bake at 375 º for 15 – 20 minutes. Cool on wire rack. Repeat entire process for remaining dough. Store in rigid plastic airtight containers in refrigerator or freezer for later use. They are best served at once out of the oven or reheated. Notes: This product is worth the effort. There is nothing on the market quite like these. 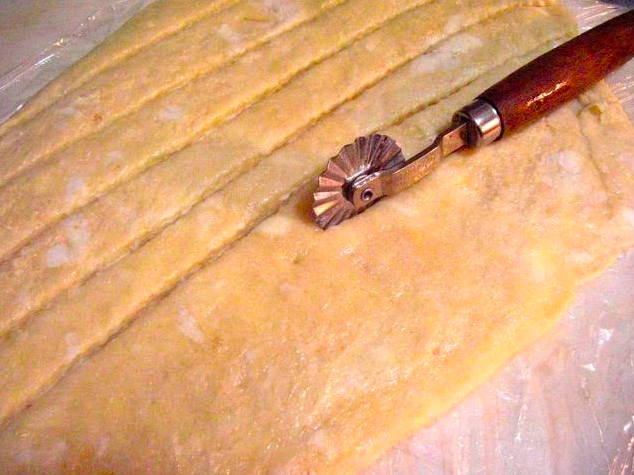 The dough can be cut differently, as in longer strips, and you can tie a knot with the dough for added interest. I recommend making a double recipe and baking right through it, giving you extra treats on hand for instant gifts. Endnote: Christmas 1991 – my husband, Robert, and I were invited to see her, with a promise of supper. I said we would bring the wine. It was a long drive on a very dark and stormy night. As the housekeeper let us in, I noticed the house was quite gloomy, with no evidence of a table set or any food cooking, not much light, and no Christmas anything. I wondered if I had made a mistake, but soon a fire was going and I was told I could see her in a little while. We opened the wine and listened to the raging wind outside. For a few moments I had a flight of fancy in imagining that we were in the bottom of a huge castle somewhere. Finally, the summons. She beamed when she saw me and we clasped hands. I was shocked to see her in a real hospital bed. She had difficulty speaking but motioned for me to open a drawer nearby, take out some small steel balls and hand them to her. She put them to her ears and wanted me to do the same; magical musical notes came from these spheres. She took great delight in them. I knew not to stay long, promising to come to say goodnight later. The supper was laid and perhaps I will never find out who cooked the feast – many loving hands and hearts, I suspect. There was truffle pâté in a terrine with good bread, a roasted Cornish gam hen split cleanly with a very sharp knife revealing glistening fruit inside, and for dessert, a wild rice pudding. In saying goodnight, I whipped off a beautiful purple scarf with silver and gold threads I had purchased in St. Martin, for she loved purple. I had to give her one last gift, and that is exactly how it was. Postscript: In writing this piece, I opened my old book, The Art of Eating, to a marked page. 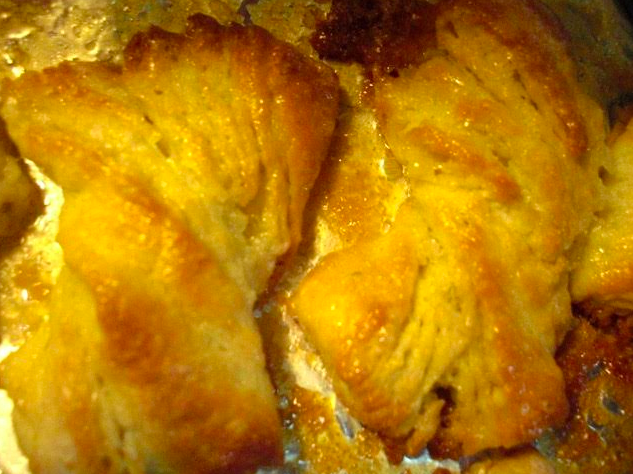 There, another favorite recipe, “War Cake.” In the ’60s, before I ever had this book in my possession, I spent 25 cents on a battered, used 1925 book titled Jewish Cooking. What caught my eye was “Eggless Butterless Milkless Schmaltz Bars.” The recipe was irresistible, easy to make and very popular, a big seller. 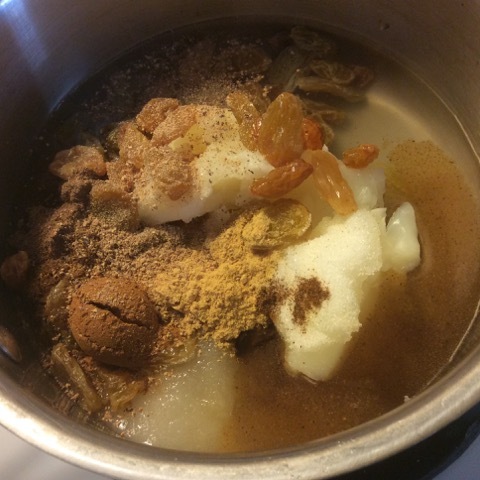 The two recipes are identical except for the schmaltz* and today, in 2016, I made it again, missing it for many years. 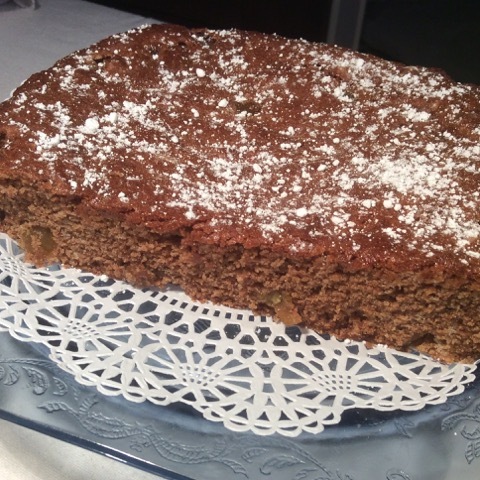 With permission we offer M.F.K.Fisher’s delicious War Cake recipe from How To Cook A Wolf. Sift flours, soda, salt and baking powder together, set aside. Put remaining ingredients in a saucepan, bring to a boil and simmer for 5 minutes, then cool completely. Add flour mixture and mix well. 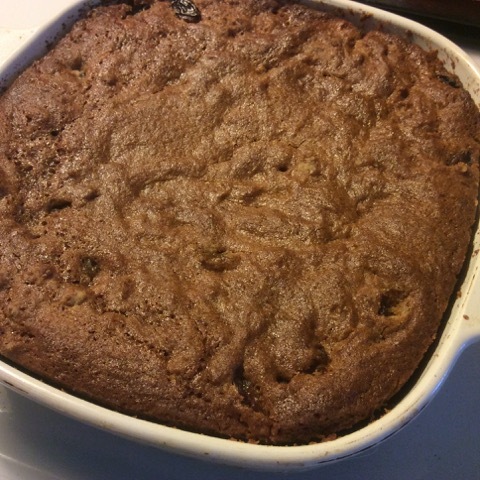 Bake 25-30 minutes in a well-greased 8-inch square baking pan., 350º oven. This type of cake is always better the next day. It is very sweet, happy to be just dusted with powdered sugar. *Schmaltz: rendered chicken fat; WAR CAKE was made when eggs, butter and milk were in wartime short supply. 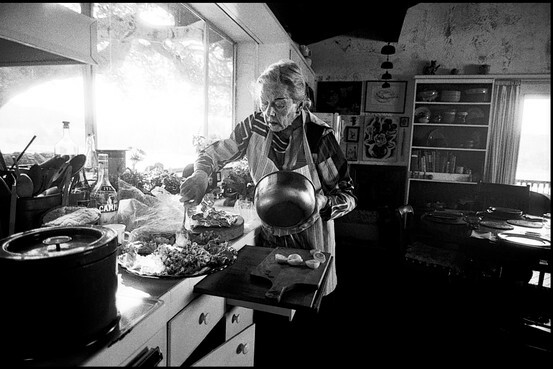 Listen to Julia Child introducing her late friend, M.F.K. 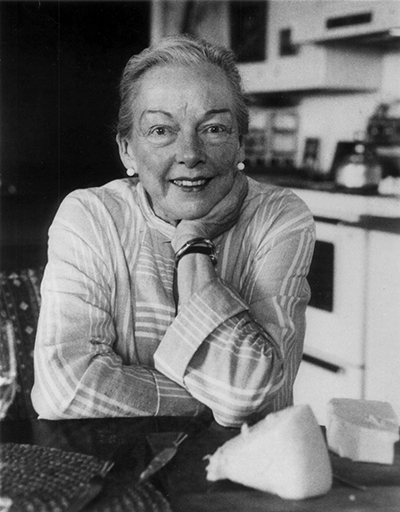 Fisher, who takes us out for a staggeringly gluttonous meal at a French roadside inn.It was written in 1937, recorded in 1985—the only recording ever made of MFK Fisher reading a story. 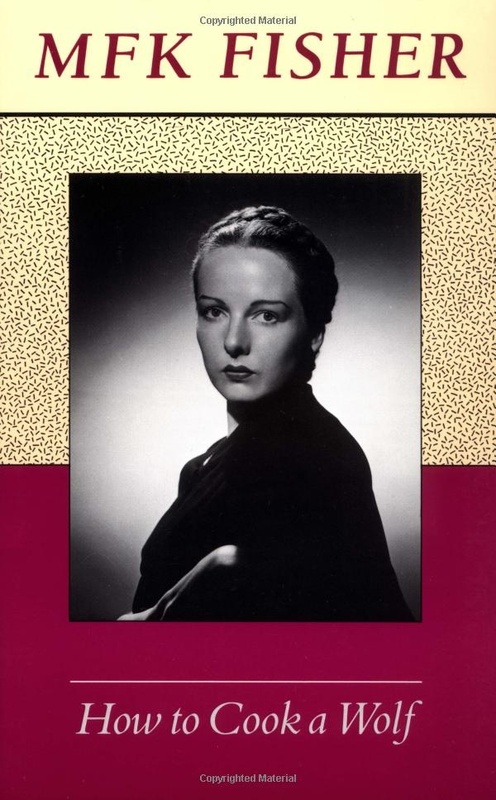 We urge you to seek out MFK Fisher’s wonderful books your local book store. They are also available from Amazon and Indiebound. This entry was posted in Columnists, Eat, Eat: Recipes and tagged A Baker's Dozen, Dianne Boate, Eat, M F K FIsher, recipes. Bookmark the permalink.